I had this beer on draft several years ago when in Long Island NY and really liked it. I have not been able to find it in bottles until I stopped in State Line Liquors a few Friday’s ago and found that they were having free rep tasting. This was one of the beers offered at the tasting. I bought a 6 pack along with several other beers to take to a party that night. I managed to bring one back home with me to review. The bier pours a clear amber with copper hues and a white to off white head. This bier is darker in color than I expected or for that matter most Belgian Pales. 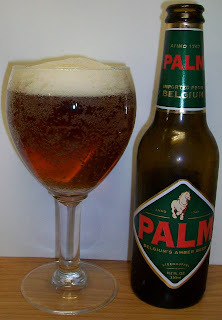 The nose is also different for Belgian Pale or Blond. This nose is more like a lager. There are not the typical citrus notes and fruit esters on the nose. Don’t get me wrong the nose is nice with pilsner type malt aromas and light floral hops. The hops on the nose are also a little unusual for a Belgian Pale. All and all this nose is very inviting; different for a Belgian but very inviting. Ahh, that’s a nice refreshing ale; clean, crisp and refreshing. The taste starts out with sweet light malts up front followed by a very refreshing effervescence over the tongue in the middle of the sip. The back-end is very easy to drink with an effortless swallow. It is fairly light and floral but there is a definite hop presence on the finish of this beer. There is little to no aftertaste; just a slight light hop and malt flavor. I like this bier but it is also a little confusing. It does not really taste like a lager but it is more “lager like” and definitely does not drink like a typical Belgian Pale or Blond. The light hop bite on the finish really adds to the refreshing aspect of this bier. It’s so different from most Belgian Pales I’m going to give this a C+ for a rating in style. That may not be fair for an overall rating. I really did enjoy this beer. It does not have the typical sweetness and fruit qualities of a Belgian Pale. It really does drink more like an English pub ale with a lager characteristic.